golfers go by during the day and wildlife at night). The condo is on the ground floor and nobody is above. We provide a non-smoking environment. Please use outdoor areas for smoking only. Unfortunately, the present tenant has encountered health issues and had to cancel the remainder of her stay. TV with VCR/DVD, Microwave, Refrigerator, Electric Stove, Toaster Oven, Washer/Dryer, gas furnace, fully equipped kitchen with utensils, pots, pans, dishes, glasses, cups, coffee maker, dining room linens. All bed linens, towels,alarm clock, hairdryer are provided - just bring your tooth brush! Social membership is available at the golf course which allows you to use pool, tennis, workout room and receive discounts on restaurant and pro shop, which are in walking distance from the condo. Free WIFI!!! 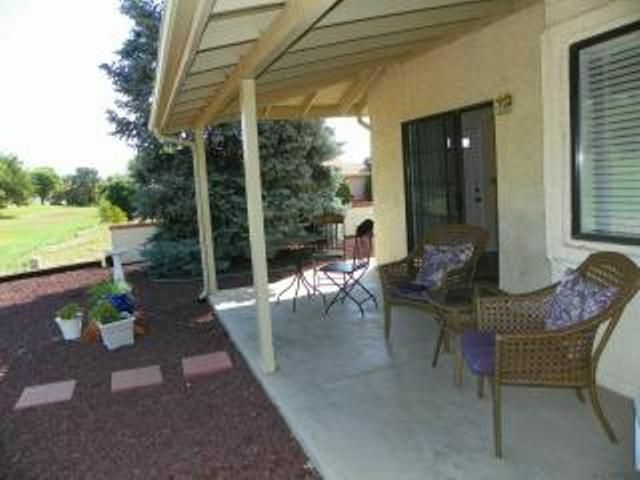 We had a very nice stay in the Prescott Valley. The accommodation was as described, and the location being right on the Golf Course was very convenient for us. We stayed for the month of March, and it was very relaxing. The weather was a bit of a surprise in the 2nd week as it was cooler than expected. However, that seems to have been the case all over Arizona in 2019. Edie was a very gracious host. My husband and I enjoyed our winter stay in this cozy condo. My husband enjoyed watching the golfers go by daily and the condo is close to the club house so we went golfing in the afternoons when it was warmer. The area is very quiet but is also close to shopping and restaurants. I'm really glad you enjoyed yourself! I would love to have you visit again. We had a comfortable stay in Edie's little house. Might be able to do so again in the future. Thank you, Margit! I hope you got your money by now? Wishing you a great Fall! We stayed one month in this condo. Loved the location, really nice back patio backing up to the golf course. Felt so open and private at the same time. Nice little fountain and bird bath. My husband enjoyed watching the golfers and birds. Edie is a very gracious hostess. The condo is well stocked with everything you would need, paper products, cookware, soap, detergent, even some basic food items. Lots of closet space and drawers to store clothing and all the stuff we bought to bring back to our home in Mexico! I believe the condo is a good value for the rent charged and will definitely return. Thank you Edie for a "comfortable home away from home!" We chose this condo because of its convenient location on Prescott CC and favorable prior reviews. Kitchen is well stocked with very nice quality utensils and tableware. Cute patio with comfortable wicker chairs. Bed (queen-size) very comfortable. Linens outdated, faded and pretty well used. Closet full of extra linens and not much shelf space left to use. Living room furniture needs replacement - not one comfortable piece of furniture. Sofa bed and two chairs looked as if they had seen better days. Window blinds bent. Wifi very slow - you will share wifi with neighbor. TV station selections minimal - unless you like all the info-mercial channels. This would be a very nice vacation rental if owner makes a few changes. I am very surprised to receive such a bad review - the first! Especially since it is my sincere desire to make everyones stay as comfortable as possible. The large walk in closed serves to hang cloths - most of the shelving serves to store linens, towels, paper supply, games etc. - but there is some shelving for personal use. The apartment has a good sized high boy with large drawers, a night stand with drawers, a cabinet in the living room with drawers and a storage room for larger items like golf clubs etc. As to the "faded and well used" linens - I checked and found only one set that was less then new. I purchase my linens at Costco and the "faded design" seems to be the look - certainly not from over use! In fact I delivered a newly purchased set while the guests providing the review were in residence. Blinds: only one slate at the very end covered by a curtain was slightly bend. Spots in carpet: The carpet cleaner reviewed and said it was just some shading. The carpet gets regularly cleaned. The 2 leather chairs, one reclining, are certainly comfortable according to a new guest reviewing the condo. The sofa is a La-Z boy queen size sleeper sofa which is extremely comfortable. While the furniture in the living room is not new, they are certainly more then serviceable and in good condition. The wifi is no longer shared. I offered to upgrade TV channels for the same amount that the server charges me - the guests declined. Maybe this was the real reason for the review! The condo is at the back of the building so use the right hand sidewalk next to the wall. Parking for at least 5 cars for 3 condos...park by your sidewalk. Have a flashlight just in case lights are out. Six rooms including walk-in closet...plenty big for 2 people. House has t-paper, p-towels and kleenex. Water pressure in the shower is fantastic. Kitchen has washer/dryer, micro, coffee maker, bagel toaster, blender, toaster oven, mixer, small crock, cookie sheets, casserole and lots of pans, skillets. If you need something, head for Goodwill in Prescott Valley. Nice little patio out back with a gas grill. Bring your binoculars and watch the birds and the golfers. Keep water in the bird bath...there is a robin who needs a full bath every day. There are books, games, movies, cd/cassette player, dvd/vhs player, cable, wi-fi. Golf a bit costly here at the club...hubby went to Quailwood. Be aware...state parks may require permits to park & hike. Some Prescott parks also require permits but are free on Wednesday so plan your days. Letterboxing and geocaching in the area. We did an overnight to Grand Canyon, and day trips to Jerome (go early or overnight), Fort Verde, Montezuma's Castle and Well, the Apache Trail (go early...fantastic but be careful...we hit a hole & destroyed a tire). Casinos in Prescott (Bucky's has prime rib on Thursday nite) and near Fort Verde. We liked this house...Edie very accommodating. Got a problem, just ask her. And we loved the area. Everything you could possibly need can be found in Prescott Valley or Prescott and parking is free, even in the public parking structure. Come and enjoy. It was very gratifying to receive such a nice review in writing. Many times reviews are positive, but only verbal. It is important to me that my clients enjoy a good time and from my end, I will do everything I can to ensure this will be the case. fish and for boating, walks in the pines, horse back riding nearby, hiking in the mountains. Prescott Vally has frequent events in the sports arena, large cinema center and many restaurants.